Yes Mam, April is nearing its end, but that doesn't mean no more challenge, in May I will be your DCD challenge host and hope you enjoy what I have in store for you. Here is a little sneak peek of the example card I will be showing to kick it off. There is still time to enter hostess Paula's recipe challenge, before it closes. So hurry and make a card for a chance to win a fabulous prize! Well I'm hopefully over my computer woes (fingers crossed). So I thought I would share some more wonderful cards made for this month's challenge. Here is another card I made for Hannah's 90 minute scramble. Which fit into our Recipe challenge for this month as well. 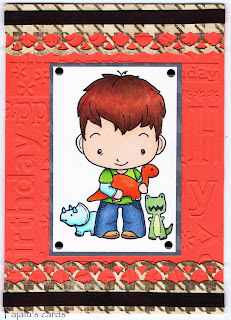 I also used the sketch from this challenge at Lily Pad Cards. To Hannah, I say thank you for the fun challenge :), I had a great time till my 'puter decided to crash again :(. ﻿This card is by Cazzytime & you can see more of her creations here. Rosemary created this amazing card & you can see more of her cards here. ﻿Ettevyke made this wonderful card & you can see more of her cards here. Aren't all these cards just so amazing. I am loving seeing what people are coming up with. I urge you to check out these taltented ladies flickrstreams to see more wonderful creations. Happy crafting everyone. I'm back with yet another card to share with you. I made this one with one of my new stamps (it's hiding in the background ;P). I used some versamark ink, Distress inks & Versa Fine ink on this card. I included some bling, buttons & a sticker (yay finally used something up!) I then used my trusty Cuttlebug & Tim Holtz's bird die for a bit more interest, then lastly I added a ribbon bow to the button. Hope you enjoy this card. Good afternoon Ladies, it's Hannah here. I thought I'd show you all a quick card tutorial, for this fun card today, please excuse all the pictures, for some reason my computer won't accept video's at the moment. 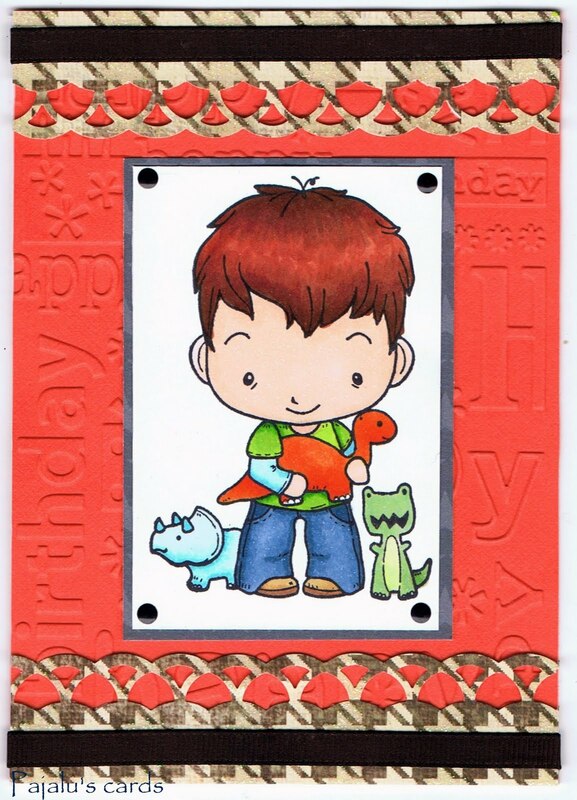 The materials are very simple and few; All you will need is a die cutting machine, an embossing folder, your card base, a stamp (or stamps) with a solid image you can color, and some ink. And here is how.....You will need the right sandwhich recipe according to your machine. Next you will ink up your image, to give a solid stamp more then one color, I reccomend stamp markers, like Memmentos or Faber castell, but if you don't have any it's not to hard with an ink pad. just take a wet paper towel or baby wipe, and wipe it away. or you can adhere it straight to the card with an adhesive runner. The card is now almost fully essembled and the only thing remaining is your sentiment. Which of course cannot be stamped directly on the raised surface of the embossed card base. Here I just cut a piece of scrap slightly bigger then the sentiment before I stamped. Attach it to your card and Looky there!!!! That probably took you less then 15 minutes at most. Did you know there is challenges in our flickr pool every month with prizes to be won? This month Paula is challenging you with a recipe challenge! no worries it's not food related the recipe is to use specific items for your creations. Go Check it out! We love your comments and any input you might have. I hope you all are having fun with this month's challenge. 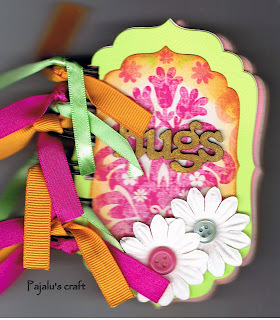 I know it can be hard to think of ways to use the ribbon, ink, embelies, diecuts/embossing folders. So I have come up with another card to share with you. I am sharing some more Recipe goodness. Here are two more wonderful cards. Just thought I'd share a few of the entries that we have recieved so far :D. This card is from Heather. you can view more cards by Heather here. This next card is by Ettevyke. You can view more of Ettevyke's cards here. Today I thought I would share with you a card I made using the same "Recipe" I used for the Mini album. I started by inking the edge of the pink paper with Spun Sugar Distress Ink. Then I distressed the edges of the pp. Sewed that to the pink paper. I added some lace from the very lovely Vera (lace can be used instead of ribbon if you prefer). Then I went to my scraps (still trying to use them up!) & used my Cuttlebug Heart Die to make the layered heart. Finally I added the flower, button & pin (with some extra ribbon). The sentiment is from this Hero Arts set. A big Congratulations to the very lovely Greta on winning this month's challenge - Shaped Cards. If you want to see more of Greta's gorgeous creations please go here. This month I have a Reciepe challenge for you all. Don't worry there is no cooking required :D.
2 embelishments like buttons, flowers etc. See easy peasy right. Here is a little something to give you an idea. I used my Nesties to make the mini album, inked the edges with distress ink, then added some ribbon & two flowers. To post a photo to this thread, all you have to do in Flickr is go to "the" picture , click on share this, scroll down to grab the html, then follow the directions for copy/paste. You can paste to the comment box on the thread. It's really easy to do. You can also tag your card with April11DCD.